AX900™ scales utilize stainless steel, hermetically sealed shear beam load cells that are certified to 5,000 divisions by the U.S. National Institute of Standards and Technologies to ensure unparalleled accuracy, easy maintenance, and increased longevity. Calibration is stored at the scale as opposed to the indicator providing users with total interchangeability of all components, while all models communicate with a wide variety of indicators and software to fit your requirements for data gathering. Now, the AX900 axle scale series combines field proven technology, the most sought after features and widest range of sizes and capacities into one complete line of above and in-ground axle scale systems to stay ahead of these ever growing requirements. No other axle scale system offers more cutting edge technology to ensure vehicles can be check weighed in the most efficient and cost effective manner. The AX900 series provides weigh bridges in a variety of lengths, capacities and configurations to weigh anything from single to multi-axle vehicles. The ruggedness and modular design of these systems make them ideal for locations where large permanent scale installations are not feasible. One, two and three pairs of weigh bridges can be connected to the optional PT20 Axle Weigher CPU to display and print individual axle, axle groups and gross vehicle weights. Because the AX900 is the only scale that performs analog to digital conversion at the scale, all platforms and cables are 100% interchangeable for maximum reliability and ease of use. For the most advanced and quickest weighing needs, vehicles can be weighed in motion when utilizing the optional AX20-WIM CPU. No longer does the vehicle have to be weighed in a series of static axle groups. Simply drive over the AX900 series scales for fast and easy weighing. The AX900 series utilizes stainless steel, hermetically sealed shear beam load cells that are certified to 5,000 divisions by the U.S. National Institute of Standards and Technologies and by OIML, the worldwide equivalent. This is the highest available degree of certification for a commercial load cell. This design ensures unparalleled accuracy, increased longevity and drastically reduced down time. Multiple lengths for variety of axle configurations. When filling any type of open-top semi-trailer or end-dump trailer, knowing the amount of material that has been loaded is vital. Overloaded trailers may need to return to the filling site to offload material to comply with vehicle weight and safety guidelines. Intercomp’s PT300DW™ Filling Scale is the ideal solution to obtain accurate weight values when a trailer is disconnected from a semi-tractor. The portability of this product allows it to be deployed in most locations, saving a trip to a permanent, inground scale to verify load weight. For transportation specialists in many industries, such as scrap metal, waste or material processing, measuring the weight of collected material is the best way to verify and track amounts prior to transport. The PT300DW™ Filling Scale allows the load weight of an unhitched trailer to be accurately monitored as it is filled in the loading bay or yard. This solution is ideal for situations where there may be space or structural limitations. The relatively small footprint of the PT300DW™ Filling Scale, coupled with the mobility of independently placed pads, allows for deployment in most locations. In concert with the AX900™ product line, which boasts a variety of lengths to accommodate various axle groupings, from standard double axles to spread axle groupings, weights for virtually any standard-width vehicle can be collected. The scale offers a decrease in downtime with integrated solar charging, plus the added flexibility of built-in RFX™ Wireless Weighing and roller wheels included with each scale pad. 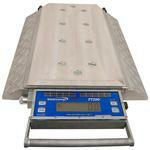 The PT300DW™ Filling Scale, with 30,000 lb per pad capacity, is a variant of the time-tested PT300DW™. The additional billet aluminum material added to the top of the scale resists the high point loading produced by the small surface area of landing gear feet on semi-trailers. Convenient roller bearing wheels were added to ease mobility with the stronger pad surface. 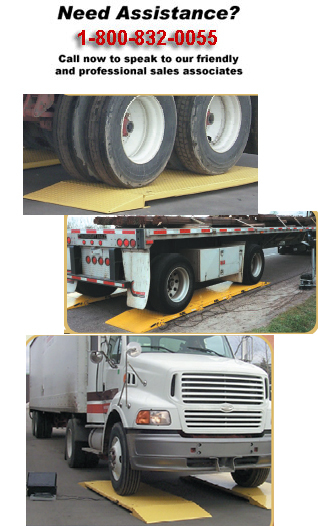 In addition, the PT300DW™ Filling Scales can be utilized as a stand-alone system, or with most Intercomp RFX™-enabled static scales and indicators, to weigh anything from passenger vehicles to shipping containers. 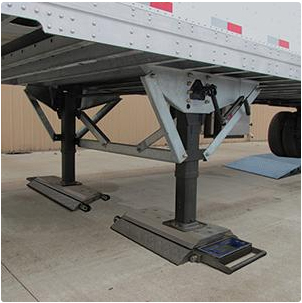 The thicker weigh pad ensures that the heaviest of mistakenly overloaded shipping containers or semi-trailers will not cause damage to the scale pad. This product is an ideal option for monitoring SOLAS (Safety of Life at Sea) compliance. 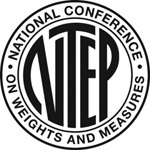 Ability to weigh an empty trailer with a portable scale system. 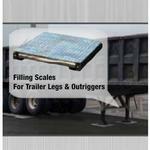 Most any length and width of trailer and landing gear can be weighed. Easy placement under the trailer axles for quick filling. Quick weighing of bulk material, tankers, scrap metal, and custom machinery. Trailer is dropped from the tractor and placed under a "loading bin." Trailer is weighed in the truck bay while being loaded. The facility may have a certified truck scale at the entry/exit, but not at the filling point. Ideal for areas with height restrictions, foundation repairs or budget constraints. The modular design of the AX900 will accommodate most any trailer length and axle spacing. Real time weights at the point of filling a trailer. This system eliminates having to return to the truck bay to remove material just loaded on the tractor trailer.